Order your plasmid.com DNA preps here as you need them in Maxi, Mega and Giga scales using the form below. Antibiotic resistance is limited to Ampicillin or Kanamycin. Want to make ordering DNA even easier? Try out an unKit! Stay updated on our latest discounts and special offers! Subscribe to emails from the plasmid ninjas. Any promo code discounts will be applied after checkout. Depending on the number of preps, this may take a few minutes. 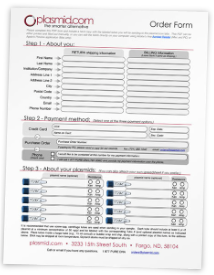 Download and complete the plasmid.com PDF order form. This form can be downloaded and filled out right from your computer. After completing the information, print a copy of the pdf and include it with the sample material you will be sending to the plasmid.com labs. You can either send the completed form and sample material directly to the plasmid.com labs, or you can call a plasmid.com Client Support Representative to have them enter your sample information into our database before the material is sent. Or another option - unKits! Pay less per prep and receive free return shipping. 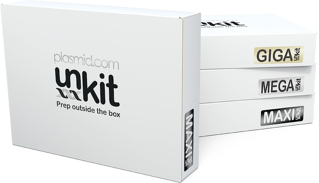 Give your purchasing department a break by buying an unKit. The only way it could get easier is if DNA made itself! Still not sure what an unKit is all about? Check out our unKit order page. Buy 3 Maxipreps, get 1 free! Purchase 3 Maxipreps during April using promo code SUNSHINE19 and get 1 free Maxiprep with your order. No other discounts apply. Contact us with any questions.